Microsoft Expression Design 2 includes exporting tools that create assets that you can import into a Microsoft Silverlight 1.0 project that is open in Microsoft Expression Blend 2. This is useful when you want to use the extensive design features of Expression Design 2 to create pieces of the user interface for your Silverlight 1.0 application. 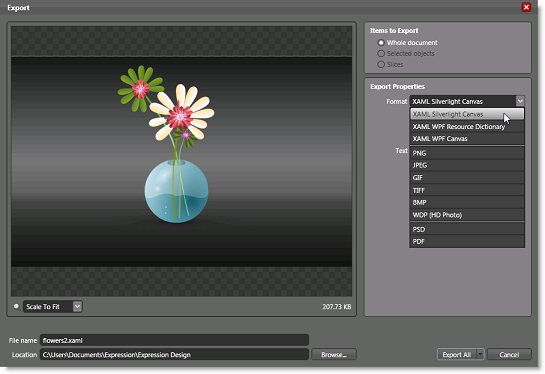 With a project open in Microsoft Expression Design 2, click to Export on the File menu. The Export dialog box appears. Under Items to Export, select Whole document. 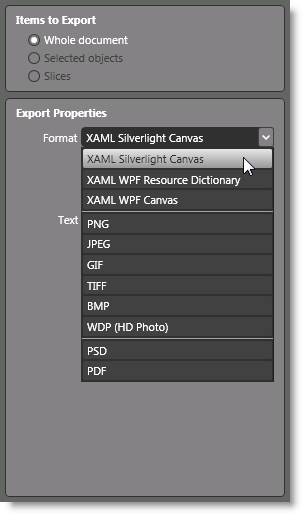 Select XAML Silverlight Canvas to import the whole canvas into a Silverlight 1.0 project, from which you can copy and paste objects into other documents. Select XAML WPF Canvas to import the whole canvas into a WPF project, from which you can copy and paste objects into other documents, or create a user control from the objects. Select XAML WPF Resource Dictionary to be able to import each layer into a WPF project as a drawing brush resource that you can apply to Brush properties. Accept the defaults and click Export All. A Silverlight 1.0-compatible XAML document is created that includes objects that represent your artwork. In Microsoft Expression Blend 2, on the Project menu, click Add Existing Item, browse to your exported file, select it, and then click Open. The exported file is added to your project. Double-click the file to open it on the artboard. Using the Selection tool, you can select objects on the artboard or under Objects and Timeline. Hold the CTRL key to select more than one. On the Edit menu, select Copy (or press CTRL+C). Open the document into which you want to paste the objects, and then, on the Edit menu, click Paste (or press CTRL+V). 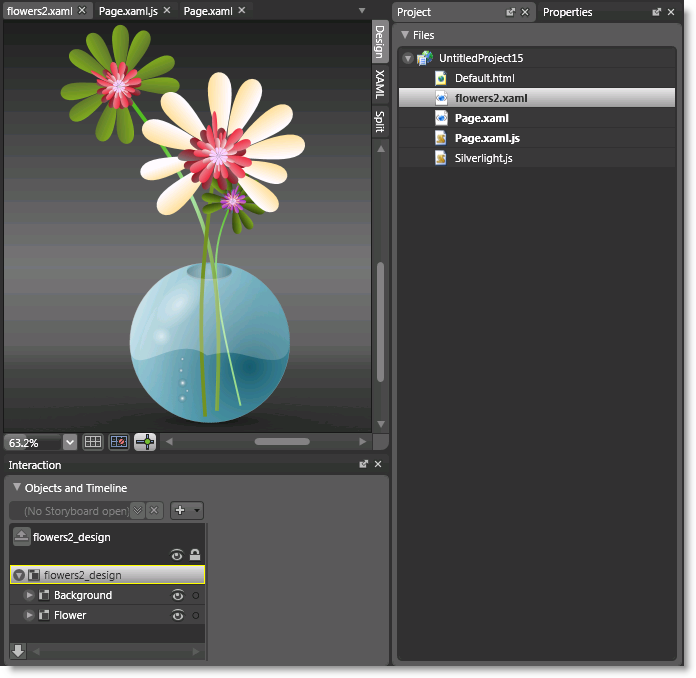 The objects from your Expression Design 2 project are now in your Silverlight 1.0 project. Instead of copying and pasting from the exported file into another document, such as the Page.xaml file, you could make the exported file the starting XAML file of your Silverlight 1.0 application. For more information, see Change the startup page of a Silverlight project in Expression Blend 2.